Ecstatic Peace Library, 9781616234959, 251pp. Throughout the heady years of New York's 1960s and 70s music scenes, James Hamilton was on hand to observe and photograph some of the most significant bands, musicians and performances of the twentieth century. Serving as staff photographer for the Village Voice and Crawdaddy , Hamilton photographed such musicians as James Brown, Captain Beefheart, Ornette Coleman, Creedence Clearwater Revival, Crosby, Stills, Nash and Young, the Grateful Dead, John Fahey, Mick Jagger, Jethro Tull, Elvin Jones, the Kinks, Madonna, Charlie Mingus, Joni Mitchell, the Ramones, Gil Scott-Heron, Patti Smith, Sun Ra, Tom Verlaine and Stevie Wonder. 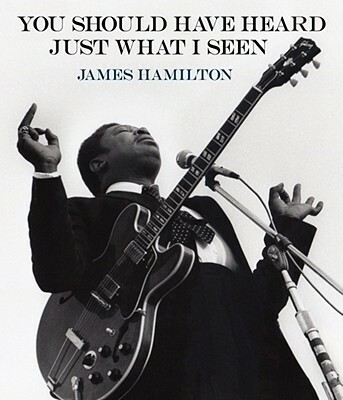 In You Should Have Heard Just What I Seen, Hamilton opens up his archives for the first time, revealing across 300 pages a trove of previously unpublished black-and-white photographs--portraits, snapshots, sketches, contact sheets--of some of the most recognizable faces in music. Influential for several generations of budding photographers raised on his photographs, the work of James Hamilton is at last collected in this revelatory volume. As a young man in the late 1960s, James Hamilton met the legendary photographers Diane Arbus and Eugene Smith, and was inspired by them to document the changing skyline of New York City. As staff photographer for Harper's Bazaar and the Village Voice, Hamilton recorded the fashion shows, events, protests and riots, happenings, concerts, poetry readings and art openings of that era, and throughout the 1970s, his photographs of musicians and celebrities began to appear in the pages of Crawdaddy magazine. Later Hamilton joined The New York Observer and began working with filmmakers George Romero, Francis Ford Coppola, Wes Anderson, Bill Paxton and Noah Baumbach as on-set photographer.